We look back at the launch – and the achievements – of our Barb’s Beer campaign after an exciting first year as we prepare for expansion to the east coast in 2016. The news clip, left, shows Seattle’s KING 5 coverage of the Seattle success. The second video, left, shows the kick off in July, 2014 and a look back at year one. Visit STORY for details on how Barb’s Beer and our “Racing to the Cure” promotion is attracting an impressive group of leaders to support Dr. West’s GRACE (cancerGRACE.org) and help find a cure for lung cancer in Barb’s name. 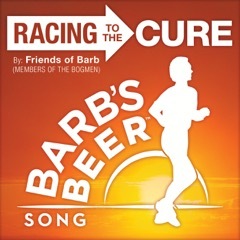 This third video shows the Barb’s Beer – “Racing to the Cure” song on You Tube. 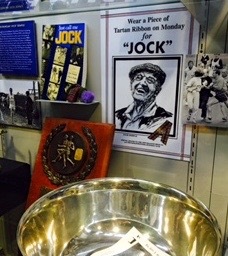 The book “Just Call Me Jock” (1982) occupies a spot in the trophy case at Boston Athletic Association headquarters in Boston. The 2017 Boston Marathon will mark the 50th anniversary of Jock chasing Katherine Switzer down the road in the 1967 marathon to “retrieve” the Boston Marathon number he gave her by mistake, he said, after Katherine applied as “K.” Switzer. Jock believed he was just “protecting the rules,” but photos of Jock getting pitched into a ditch with a shoulder block from Kathy’s boyfriend ran page one around the world – and Jock’s chasing Kathy that day effectively helped usher in women’s running in America. “I made Kathy famous and myself infamous,” said Jock, who became great friends with Kathy once the rules were changed by 1972. Look for an updated edition of “Just Call Me Jock” in time for the 2017 Boston Marathon. Tom will donate all proceeds from his share to the Barb’s Beer Foundation. SPECIAL: Tom will run the BOSTON MARATHON April 18 to generate awareness for Barb’s Beer and help bring the “Racing to the Cure” campaign to Boston and the east coast off the program’s success in the NW. Learn how you can SUPPORT TOM’S RUN in two ways! Visit SLIDE SHOW to hear the song played out against photos of the campaign in action.